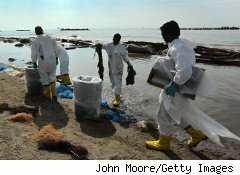 The lead investigator for the presidential panel investigating the Deepwater Horizon oil-spill disaster refuted previous reports that the rig's majority owner BP (BP) and contractor Halliburton (HAL) compromised safety by cutting corners during the rig's construction, The New York Timesreports. "We have not found a situation where we can say a man had a choice between safety and dollars and put his money on dollars," the newspaper reported, citing a presentation by Fred Bartlit, Jr., the lead investigator. "We are not making any legal judgments on liability, negligence or gross negligence or any legal issues at all." While the commission, appointed by President Barack Obama, has found that cement problems for the 18,000-foot-deep well were a major cause of the accident, Bartlit said the structure's complex system makes it impossible to target a single flaw that would've caused the disaster, according to the Times. On Oct. 28, the federal commission investigating the disaster issued a scathing report, saying BP and its cement contractor Halliburton knew that test results for the cement to be used as a plug for the bottom of the oil well showed the cement was unstable, according to a letter that Bartlit gave to the commission, the Times reported at the time. According to the letter, Halliburton conducted four tests on the cement slurry, two in February and two in April. One of the February reports was provided to BP in March, but there was no indication that Halliburton flagged the foam stability data and no indication BP raised questions about the results. The second February test also produced results that showed the cement slurry would be unstable. BP, which took a second-quarter charge of $32.2 billion to account for expenses relating to the explosion, said on Nov. 2 that it returned to profitability during the third quarter, though still took a $7.7 billion pre-tax charge related to the explosion. The April 20 explosion killed 11 workers and spewed 4.9 million barrels of oil into the Gulf of Mexico, creating widespread damage to the ecosystem along the Gulf Coast and creating billions of dollars of economic damage to the region's fishing, shellfish and tourism industries. BP owns 65% of the rig.